Formula 1 racing may be the most fast-paced and highly entertaining sport on the planet. In the many decades of professional competition, dozens of drivers have possessed skills and nerves that have allowed them to be considered among the greatest F1 drivers of all time. After thoroughly searching the history books and combing the planet for the best F1 drivers of all time, here are our top five. Any list of F1 greats that does not include Michael Schumacher should be dismissed immediately. The 43-year-old German legend has been lapping the field since he burst onto the scene in the early 1990s, and he is very much a force to be reckoned with today. A mind-boggling 91 wins in 290 F1 starts sounds too good to be true, but Schumacher has blended a natural driving acumen with a complete fearlessness en route to a dominating career. A few minor instances have irked those that don’t happen to be fans of his, but Schumacher’s 20-year reign is not yet over, and this racing legend deserves his place at the top of this list. Born in the summer of 1911, Juan Manuel Fangio essentially grew up alongside the automobile. It has been said that Fangio came from a racing family, but his ancestors were riding on the backs of horses instead of inside of bullet-shaped cars. Fangio participated in the inaugural season of F1 in 1950 at the age of 39. He led the blossoming sport through the 50s, attaining an incredible 24 wins in 51 career starts, and took 2nd or 3rd place another 11 times. Many consider the Argentinian-born Fangio to be the father of F1 racing, and experts often ponder the possibilities of him having been able to enter F1 racing as a 20-year-old. Curly-haired Frenchman Alain Prost was a winning machine during his 13-year career. Prost was the poster boy for F1 racing in the magical 1980s, as F1 began to gain attention in all corners of the globe. The third slot is a perfect place on this list for Prost, who won 51 races in his career, which ranks ahead of everyone on the planet other than Fangio and Schumacher. Often referred to as “The Professor” due to his calm, calculated and tactical driving style, Prost was a fan favorite on the F1 circuit. Up until his tragic and seemingly avoidable death at a track in Imola, Italy in 1994, Ayrton Senna was carving out an incredible F1 racing career. Well on his way to eclipsing the win totals of the others on this list, Senna had accumulated 41 wins in 162 starts when he passed away at the age of 34. An arch rival of the aforementioned Alain Prost, the two constantly pushed each other toward greatness in the second half of the 1980s. 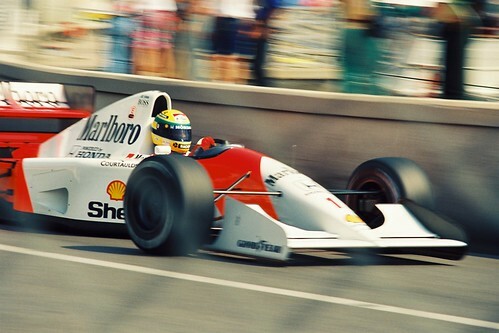 Senna employed a gutsy, all-out style that was both admired and feared by many of his competitors. Another racing legend in the making that died far too young was Englishman Jim Clark. Born in 1936, Clark made 72 stars for Team Lotus in the 1960s and won a highly impressive 25 races. Clark could drive anything with wheels to a victory and proved so by winning the Indianapolis 500 in 1965. A mechanical mind allowed Clark to tune his engines to his preferred calibration personally, and his expertise showed on F1 courses all over the world. Sadly, Clark was killed in an accident at a German track in 1968. Jim Jones writes for breakdowncover.org and covers a number of motoring related topics. This entry was posted in Motorsports and tagged Alain Prost, Ayrton Senna, cars, f1, f1 drivers, f1 greats, Formula 1 racing, formula1, german legend, Indianapolis 500, Jim Clark, Juan Manuel Fangio, Michael Schumacher, motorsport, professional competition, Racing, sport, Sports Archives, Team Lotus. Bookmark the permalink. I would have to say that Ayrton Senna is the best for me. He was fearless.